HTML5 is fast emerging as the industry standard for building rich interfaces. However, there are quite a few technical challenges while developing content in HTML5 and not all browsers support this format consistently for instance; the video support is limited and many more such issues. With Apple’s iPad, iPhone, and iPod devices choosing HTML5 over Adobe Flash, HTML5 has the potential to become an important factor in all the upcoming classes of portable devices. E very eLearning developer and course creator today has many queries about HTML5 - its usage, benefits, issues, etc. They are in search of a wholesome solution that creates engaging HTML5 compliant interactions. Raptivity leads the eLearning domain with its foray in mobile learning. It will be releasing its latest version of Raptivity 7.0 in the first week of March 2012 which will have the world’s largest library of eLearning interactions for iPhone, iPad and other cutting-edge mobile computing products. On that account, to get you acquainted with the HTML5 interactions, Raptivity team has organized a special webinar on the 6th March, 2012. This webinar will provide an overview of the latest features of Raptvity 7.0 and showcase the HTML5 interactions live in action. 35 interaction templates with HTML5 publishing option. 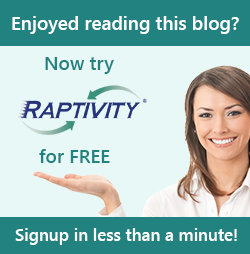 How to convert your existing Raptivity Flash interactions to HTML5? Tracking HTML5 interactions using SCORM 1.2 and 2004 standards. Publishing of Flash and HTML5 based interactions in a single click. Sample HTML5 courses created using Raptivity interactions. So, quickly register to qualify for a special early bird discount to be announced during the webinar. Looking forward to meeting you all at the webinar. Hi friends, This is Rebeka from Chennai. I am a technology freak. I have read your blog. It was really a wonderful article and I was really impressed by reading this blog. Thanks for sharing this informative blog. I did HTML5 Training in Chennai at FITA academy, Its really useful for me to make a bright future.